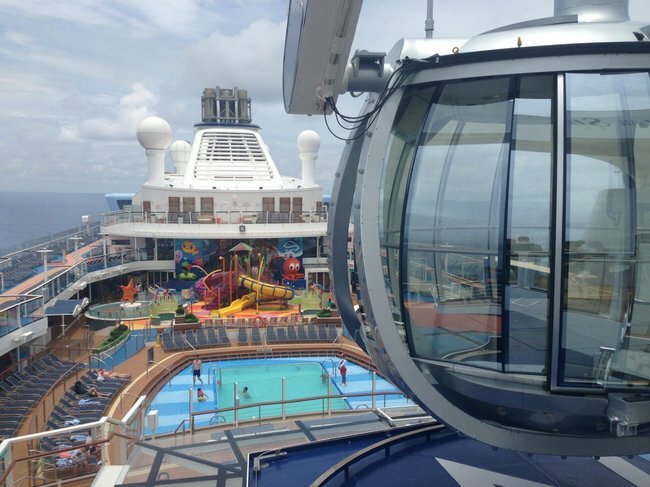 What is a cruise like? Allow me to tell you about mine. Nine telltale signs you might be a 'cruising person'. Everyone has a mental list of things they can never imagine themselves doing in life. Until recently, skydiving out in the middle of the ocean would have been right up there on mine. Because I am (a) not great at adventure-type things, and (b) find the concept of the open ocean slightly terrifying, that particular combination of activities would completely shred my nerves. Alas, I found myself doing exactly that about a month ago. In truth it was a skydiving simulator situated 18 storeys above the water, but it’s closer than I ever thought I’d get to hurling myself out of a plane (and still managed to make my cheeks flutter like a handkerchief in the wind). 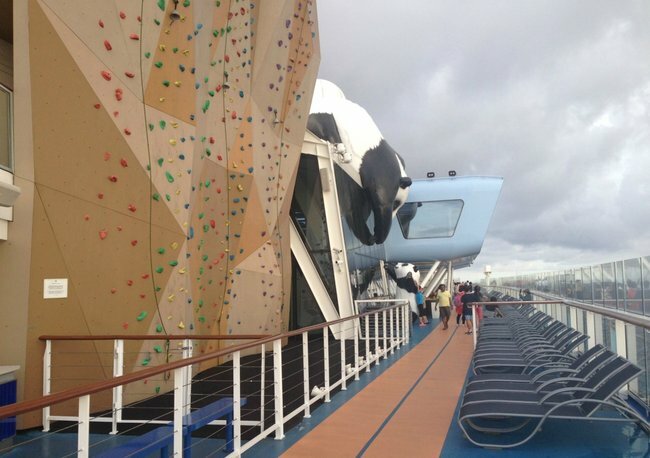 It also happened to be on board the fourth largest cruise ship in the world. Ovation of the Seas&apos; skydiving simulator. A lot more exhilarating than it looks. 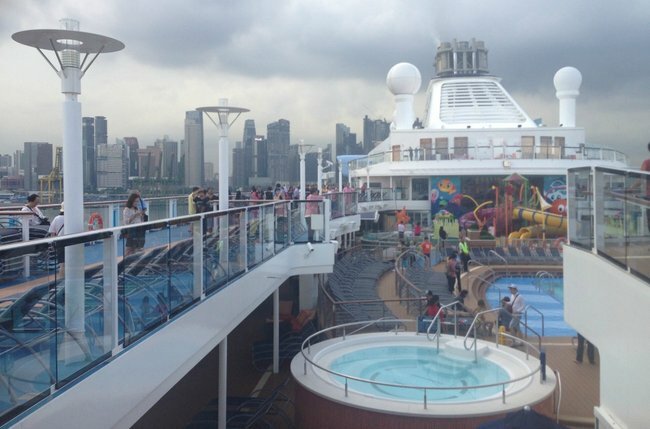 For five days, I sailed from Singapore to Thailand and back on Royal Caribbean International’s Ovation of the Seas. It’s the biggest ship to ever sail in Australia - we’re talking 18 decks, 6500 guests and crew, 168,666 tonnes, and 348 metres long. As Donald Trump would say, ‘yuge. It was my first time on a cruise, and I wasn&apos;t sure I fit the mould of a &apos;cruising person&apos; - but it was almost impossible to pin down one thing everyone on board had in common. So, if you’ve ever contemplated whether or not cruising would be your kind of holiday, here are some signs that might help to guide your decision. The idea of organising every single step of a trip gives you hives. I met a few regular cruisers who all said the same thing: convenience is the biggest drawcard. Aside from getting yourself to the port and making sure you have your paperwork in order before you board, just about everything is organised for you. You don’t have to stress about getting from A to B, trying to remember which pocket you put that train ticket in, packing up every couple of days, or finding somewhere to eat. This was my stateroom (or &apos;room&apos; as us mere mortals would say) on the ship. Lots of space for napping. You really just want to veg out - but in style. Adventure holidays are amazing, but sometimes the holiday you need is one where you do... a whole lot of nothing. There’s plenty of space on a cruise to do exactly that - you can pass your time drinking cocktails by the pool, catching up on some reading, napping in your stateroom, having a spa treatment or checking out the on-board artworks. Even though the Ovation carries the population of a regional town within a much smaller space, it rarely felt very crowded. I&apos;d been mentally preparing myself to have to elbow someone out of the way for a deck chair, but it didn&apos;t happen once. Maybe I just got lucky. You’re the kind of person who has to be doing something all the time, even on holiday. Those of you who just can’t sit still for one bloody moment are spoiled for choice - on the Ovation there’s a gym, a running track around the top deck, and an indoor sports centre. There’s also a rock climbing wall, dodgem cars, trapeze lessons, a surf simulator, and of course, the iFly skydiving. Take it from me: 150km of wind straight to your face is a great way to recover from one too many Singapore Slings the night before. If you like the idea of falling over in front of a group of strangers, try the wave simulator. Sport aside, there’s a daily schedule of organised activities and sessions you can book into or just show up for, ranging from trivia and movie screenings to cupcake baking and dance lessons. Come nightfall, it’s all about the shows, musical performances, a silent disco and bar-hopping. You consider ‘all you can eat’ a challenge, not a suggestion. 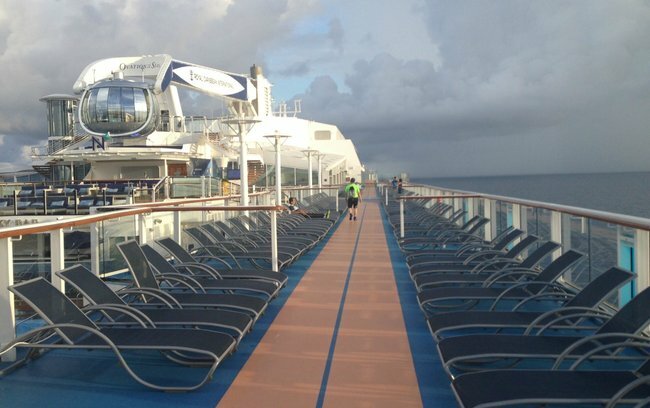 Those stories you hear about the amount of food on cruise ships are true. If you have an extra stomach lying around I’d highly recommend packing it, because we’re talking third-helping-of-Christmas-lunch levels of full. Breakfast, lunch and dinner are covered in your ticket price (drinks aren’t, though) so you don’t have to think about cost. There are 11 dining spots around the ship serving these meals - some in a buffet format, others with a sit-down menu to order from. Between meals there are ice cream and hot dog stands you can visit around the ship for a quick snack. Trust me: it’s very easy to overdo it. That’s what the gym is there for. This photo does not accurately portray just how enormous this steak was. SIXTEEN OUNCES. You can also dine in one of seven specialty venues, which you pay for separately. Jamie’s Italian is the perfect way to carb-load before a strenuous day of lounging by the pool. There’s also a kooky Alice-themed degustation restaurant called Wonderland, and Chops Grille Steakhouse - Royal Caribbean&apos;s hallmark restaurant and the site of the biggest hunk of steak I’ve ever eaten (attempted to, anyway). Beverages-wise, I have to give a shout-out to the robotic bartenders Mix and Mingle - two of the more charismatic bar staff I’ve encountered. Watching them shake and pour cocktails, all the while bopping their heads along to music, was like a scene out of a Pixar movie. Robotic bartenders are cuter than you&apos;d think. I can’t speak from personal experience, but cruising appears well suited to young families. There are a lot of activities and facilities set up for kids of various ages - as well as a babysitting service - that will keep them occupied while mums and dads amuse themselves elsewhere. The concept of ‘packing light’ is foreign to you. Four words: No. Luggage. Weight. Limit. If you want to bring five pairs of shoes, nobody’s going to stop you. Pack as many dresses as you like. You want to get a glimpse at somewhere else. Backpacking isn’t everyone’s cup of tea. Cruising allows you to enjoy the physical journey between destinations - something you can’t always say for a rickety old sleeper bus - and then get a taste of each one without too much stress on your part. I signed up for one of the Shore Excursions, which are organised by Royal Caribbean and can be booked in the lead-up to port days. Mine was a six-hour tour of the Pattaya region, taking in temples and a winery; there were also Bangkok tram cruises, ‘local life’ experiences and market visits. Guests also had the option to arrange a bus trip to Bangkok or Pattaya and go it solo. Visiting temples around Pattaya during a shore excursion. You like being able to budget in advance. The thing about holidays, especially if you’re heading overseas, is that the cost can blow up very, very quickly - even if you’re good at budgeting. The North StarThis capsule hovers 90m above sea level - it&apos;s the highest viewing platform at sea. Especially fun if you&apos;re scared of heights! 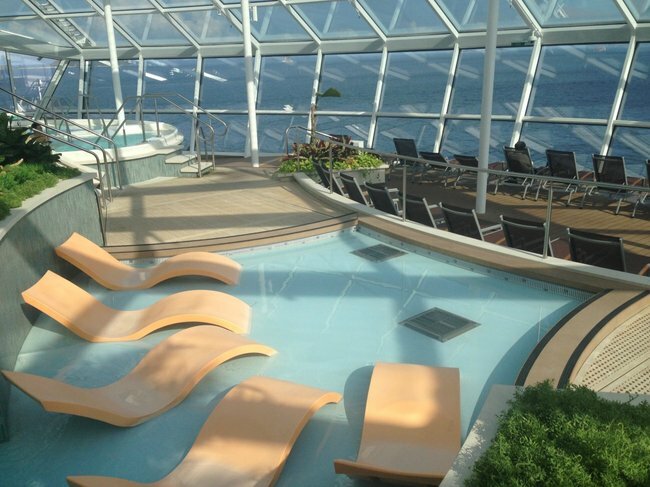 The solariumThis is a strictly adults-only section of the ship, with a bar, an infinity pool, and plenty of sunlight. Heavenly. The running track.Not a bad place to take your morning stroll. The view is really something. Sailing away from Singapore.Goodbye, Singapore. Hello cocktails! Rock climbingDon&apos;t be alarmed - that&apos;s not a real panda. That said, there are opt-in services on board you’ll be charged for - internet access, spa treatments, and beverage packages to name a few. It’s also easy to add to your bill without realising - from souvenir cocktail glasses to professional photos, it’s wise to assume those little extras aren’t free. When in doubt, ask. You like the idea of waking up in the middle of the ocean with not a speck of landmass as far as the eye can see. It’s surreal, a little bit unsettling (especially if you start dwelling on what mammoth sea creatures are lurking below the ship), but ultimately very, very cool. Kahla travelled as a guest of Royal Caribbean International.